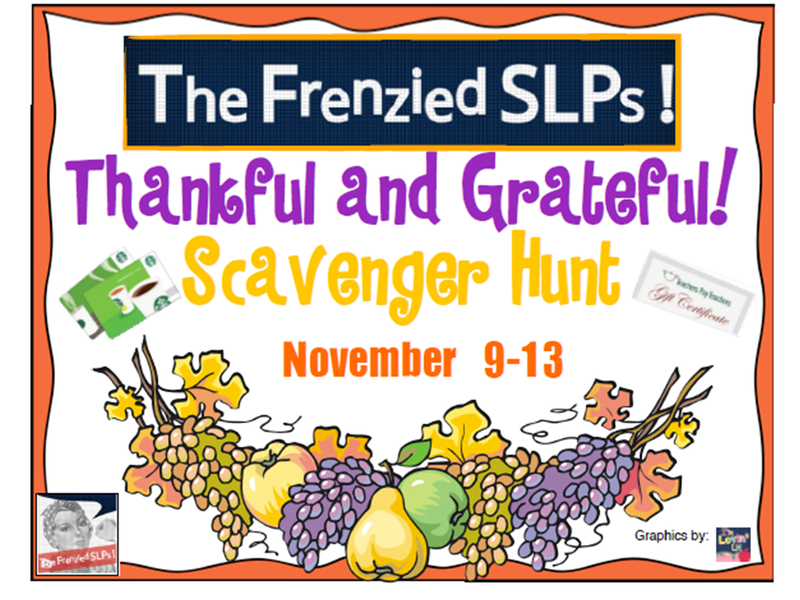 This week, The Frenzied SLPs are Thankful and Grateful for everyone who follows us and reads our frenzied posts. To thank everyone for their support, we are having a blog hop giveaway!!! We are giving away three sets of gift cards. Three lucky winners will each receive two separate gift cards! 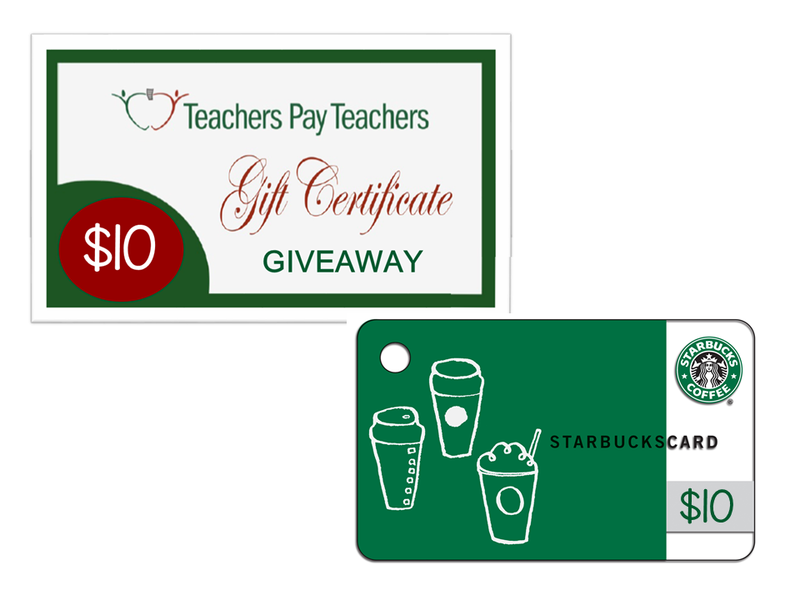 Each winner will get a $10 gift card from Starbucks (who can't use a little pick-me-up?) and a $10 gift card from Teachers Pay Teachers! To win these great prizes, all you have to do is follow our blog hop and collect the letters on the turkey signs to make a secret phrase. This is the first letter in the phrase. Hop through all the blogs to gather the letters for the secret phrase, and then enter that phrase into the Rafflecopter giveaway that you can find at the bottom of this post. You can find the next blog at the bottom of this page. I want everyone to know how thankful I am to you for following me here. When I started this all three years ago, I never imagined where it would take me! 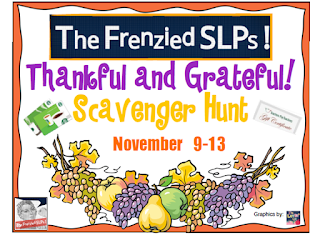 I have met so many wonderful SLPs along the way. Everyone I talk to continues to inspire me to be a better person and a better SLP. I never imagined that people would want to see my ideas that I use in my little speech room. This has been such a fun journey! So, THANK YOU!!!!! And we are thankful for YOU!! 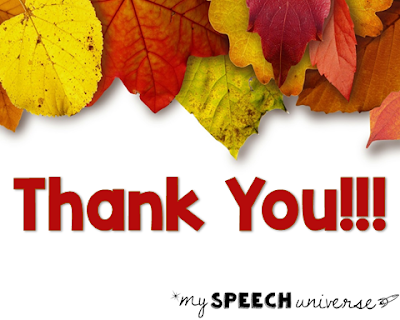 We are definitely thankful for you too! I'm so glad I met you! Thanks for everything you do! So glad to have met you too!!! I'm so grateful your journey involved us becoming friends! I agree! Now for all of us to meet in person! Thank you, Manda! I hope you and your family have a great Thanksgiving too! Thank you all for a great giveaway. Happy Thanksgiving!! I think I forgot the "our" in my entry. Ooops! Thank you, Kim! Happy Thanksgiving to you too! Thanks for helping coordinate everything!